Now, there has been anger on the streets, there have been conciliatory words from Trump and Clinton. 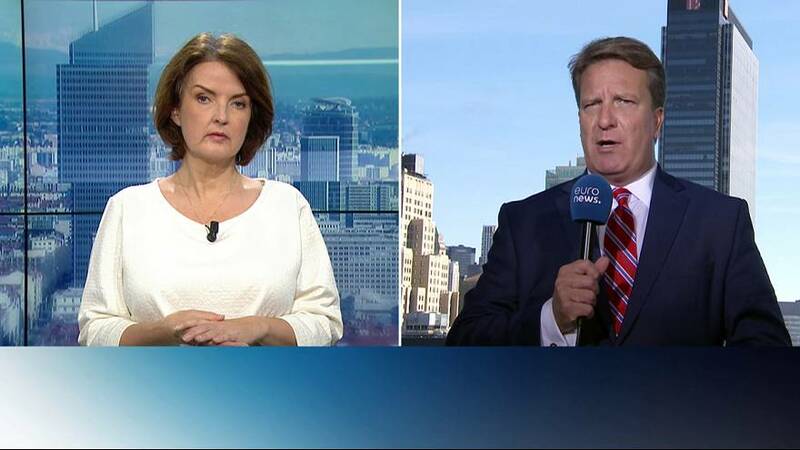 Stefan Grobe, as Euronews Correspondent in the United States, you are in an ideal position to tell us what the real mood is in America now that the shock has somewhat sunk in. Here in New York City, people are shocked and still reeling from this loss. You have to understand, though, that the way the American system works is that it favours the rural vote from Middle America and that is how Donald Trump got elected. Also, we have not seen any enthusiastic, popular outpouring of joy and support. This is, after all, the most disliked, the most hated, the most unfavourable candidate ever in the United States’ history to win the presidency. So, how we are going to go forward from here, that depends pretty much on how President-elect Trump is going to act, how he is going to interact with the other part of the country, blue America that voted for Hillary Clinton. Let’s not forget, Hillary Clinton won the popular vote so there were more Americans in this country that favoured Hillary Clinton than Donald Trump. Given also that the two administrations, the Obama administration and the Trump administration that is coming into being are two very different creations, what problems do you foresee in terms of the political transition that is about to get underway? I don’t see big problems popping up here. I think the biggest problem is the very strong personal animosity between Donald Trump and Barack Obama. Remember, Barack Obama, until last weekend, until last Monday basically, campaigned quite strongly against Donald Trump, saying ‘this man is unfit for the presidency’, saying all kinds of names and at the same time, Donald Trump always questioned the legitimacy of the Obama presidency, questioning the American birthplace of Barack Obama, so these guys don’t like each other and you can only imagine how that awkward meeting went in the White House. But, apart from that I think we are going to see a very, very professional transition period. This is what America is all about, transitions, political transitions that are peaceful, they are smooth and they should go without any hitch and Barack Obama already indicated that. BREAKING: Obama says he was 'encouraged' by conversation with Trump, calls Oval Office meeting 'excellent' and wide-ranging. How long do you think it will take for us to see the effects of the Trump administration begin to bed in in the US? Trump has made a lot of promises and put the bar quite high when it comes to his political programme. Remember, the wall between the US and Mexico, repealing and replacing Obamacare, undoing most of Barack Obama’s legacy. Now he can do only a few things directly without any Congressional actions. Barack Obama signed a lot of executive orders because Congress was unable to act. Now, Donald Trump can do the same thing. He can just sign papers undoing what President Obama did. It will be much more difficult for any Republican administration to bring things through Congress, especially as the Republican Party is still two parties, the right-wing, the ‘do-nothing’ party and it is the more moderate wing, the wing that is ready to compromise, so how this is going to play out with President Trump in the White House, that is of course the big question and we are all looking forward to watching this.